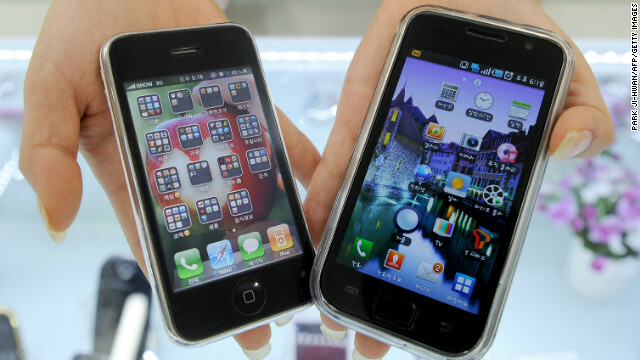 A South Korea shop manager shows Samsung Electronics' Galaxy S mobile phone, right, and Apple's iPhone 3G. (Financial Times) -- Apple and Samsung each laid claim to the spirit of Silicon Valley innovation as they delivered their closing arguments in their multibillion-dollar patent battle. Apple is demanding total damages of up to $2.75bn from Samsung for what it alleges is wilful infringement of its design patents and so-called "trade dress" rights for the iPhone and iPad in the US. Samsung, which countersued over Apple's alleged use of its wireless transmission patents and other underlying mobile-phone technology, is looking for $422m from its rival in compensation. Two additional courtrooms were provided to accommodate the large number of reporters and observers who came to the San Jose courthouse for Tuesday's closing arguments, the biggest crowd yet seen in the case. Addressing the nine jurors, Harold McElhinny of Morrison Foerster, Apple's lead counsel, compared a romantic portrayal of Apple's design process to what he characterised as Samsung's rapid "knock-off" of the iPhone. "Everyone, even Samsung, thought that the iPhone changed the world," Mr McElhinny said. "Samsung was the iPhone's biggest fan ... They tried to compete with it and when they couldn't, they copied it." In turn, outlining its closing argument, Samsung sought to portray Apple as a would-be monopolist that wanted to extract punitive damages for what its counsel suggested was a natural evolution of technology. Mr McElhinny suggested that "every smartphone does not have to look like an iPhone", showing pictures of other devices including Nokia's Lumia and a Casio phone. Mr McElhinny alleged that Samsung had "disrespected" the legal process by refusing to bring its most senior executives over from South Korea, a position he contrasted with appearances from Apple's Scott Forstall and Phil Schiller, its software and marketing chiefs respectively. "They were willing to face cross examination," he said. "No Samsung executive was prepared to come here from Korea and answer questions under oath. Instead of witnesses, they sent you lawyers." Mr McElhinny's summing up focused on Samsung internal documents that referenced the Korean firm's "crisis of design" in the face of the iPhone. He pointed to warnings from Google that Samsung should not copy Apple's device too closely, which he alleged Samsung ignored in a three-month design process. "In those critical three months, Samsung was able to copy and incorporate the results of Apple's four-year investment in hard work and ingenuity without taking any of the risks, because they were copying the world's most successful product," he said. The subsequent boost to Samsung's smartphone sales prompted "a whole series of iPhone knock-offs," Mr McElhinny alleged. "If you render judgment for Apple in this case, you will have reaffirmed the American patent system," Mr McElhinny concluded. "People in this valley will continue to invest -- they will hire people -- because they know those investments will be protected." 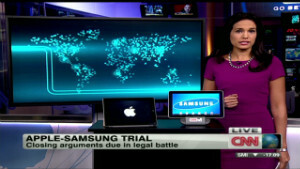 For Samsung, referencing the huge press attention on the case, Charles Verhoeven, a partner at Quinn Emanuel Urquhart & Sullivan, told the jury: "Your decision ... could change the way competition works in this country ... Is this country going to have vigorous competition between competitors? Or giant competitors armed with patent arsenals that block competition?" Despite representing a Korean firm against a local Californian company, Mr Verhoeven played on the innovation that the area around San Jose is famous for. "Competition is what has changed this country. We can see it ourselves in Silicon Valley," he said. "The real reason Apple's bringing this case is that rather than competing in the marketplace, Apple is seeking a competitive edge through the courtroom ... Apple says it's entitled to have a monopoly on a rectangle with rounded corners on a large screen." Mr Verhoeven also pointed to what he said were examples of "prior art" that invalidated Apple's design patents. The closing arguments came after a four-week hearing that has tested the technical understanding of the nine-person jury and the patience of Judge Lucy Koh, who has frequently clashed with Apple and Samsung's counsel as they squabbled daily over the evidence, procedure and presentation of the case. Last Thursday, Judge Koh, herself a former patent attorney, said that Apple's lawyer must be "smoking crack" if he expected to call a large number of witnesses in the two hours of court time remaining. Last-ditch attempts by the judge to encourage a settlement between the two companies did not succeed despite Samsung and Apple chief executives again discussing the case in recent days. But Judge Koh has also tried to be sympathetic to the jury as it grapples with a complex set of legal and technological issues. "I need everybody to stay conscious ... including me," she said before beginning to read out 84 instructions to the jury for how they should decide the case and calculate any award of damages. People in the courtroom were encouraged to stand up occasionally "to make sure the blood's still flowing". Jurors must wade through a 20-page verdict form designed to guide them through their decision, which must be unanimous. A verdict could take several days.